A bike saddle is the most important contact point on your bike. It is a no compromise piece of equipment. Because of its importance, saddle selection is the first step in the fit process. To make things simple, there are two objectives for saddle selection. For the fitter: The saddle has to promote the sort of posture and support that is optimal for the athlete’s bike position. For the rider: The only thing they need to be able to communicate is whether or not the saddle is comfortable. No pain, soft tissue pressure, chaffing, numbness, saddle sores, etc… That’s it. A good fitter will know how to position a saddle and what adjustments to make based on rider posture and client feedback. The saddle either allows the rider to achieve proper positioning while remaining comfortable or it doesn’t. There are several types of saddles: flat, narrow, wide, curved, noseless, cutout and/or anatomical. Certain saddles are more optimal than others depending on the type of cycling being performed. This is where a fitter or athlete should start. Proper cycling posture starts at the pelvis. The pelvic tilt, or how a cyclist positions their pelvis on the saddle, should work in harmony with the torso or shoulder angle. The lower the torso angle, the more anterior the pelvic tilt, the higher the torso angle, the more of your “rear” (posterior) can be on the saddle. The torso angle has a major impact on saddle selection. For example, bike positions that require low torso angles, such as the time trial position, have different saddle needs compared to road or mountain bike positions with more upright torso angles. Relative to the horizon, the time trial position requires an anterior pelvic tilt that when positioned properly will take a rider off their sit bones and onto what most would consider soft tissue. However, saddle manufactures have found a way for athletes to support themselves on their pubic rami bones. 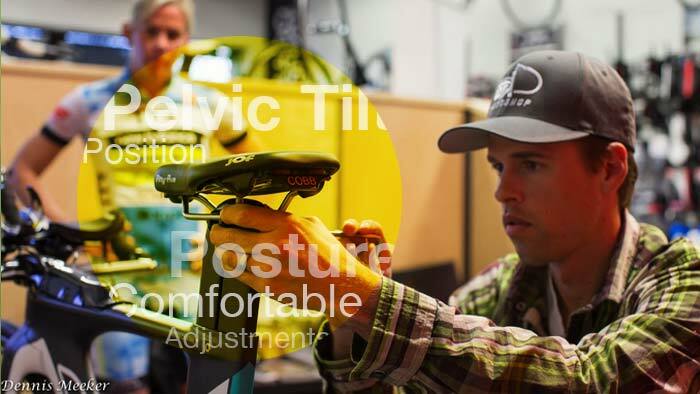 Although some time trialists still manage to ride a more traditional saddle (usually at a sacrifice to their comfort, but since the duration of their event is fairly short, they tough it out), the anterior pelvic position should be maintained. As mentioned above, an experienced fitter will help you determine proper bike position and posture based on your chosen cycling discipline. They will then have a good idea in regards to what saddle make and model to start trialing. An important thing to note is that there is no one saddle or saddle brand that works for everyone. A saddle that you love, might be unbearable for another rider. Even though most athlete’s positions are very similar from an angular perspective, they are quite different in their exact anatomy. There are fitting tools and technologies that fitters can use to aid in saddle selection and it’s encouraged to use them if available. However, I don’t want someone riding their bike in agony because the saddle that is debilitating them tested well in regards to blood flow analysis, pressure mapping, or some other form of saddle selection theory. Sustained comfort is the only real measurement that matters. It’s important to try multiple saddles during your fitting session. Even then, the real test is out on the road. After you’ve given yourself some adaptation time (this could be as little as one ride), if the saddle causes pain, soft tissue pressure, chaffing, numbing, saddle sores…the saddle doesn’t work. Saddle manufactures and shops have made it easy to trial saddles through their saddle demo programs. I’d encourage everyone to take advantage of this regardless of how much you liked the saddle on the fit stand. No one wants to have a box full of unwanted $200 saddles sitting in their garage.